From April 22 to 27, representatives of Trading Business Division visited Sri Lanka and held in-depth discussion with overseas partners on future development plans and cooperation prospects. 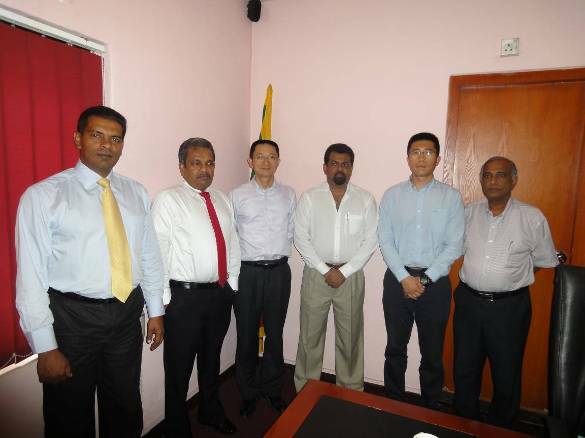 During this visit, representatives also exchanged reviews with relevant personnel of Ministry of Irrigation and Water Resources Management, Ministry of Economic Development, Ministry of Power and Energy, Ceylon Industrial Development Agency, Ceylon Fishery Harbors Corporation, and they received strong support from the Economic and Commercial Counselor’s Office of the Embassy of China in Sri Lanka. This visit has deepened friendly cooperative relations with project owners, and will lay a solid foundation for future cooperation with Sri Lankan partners. Next ： Meeting with Delegation from MAC Holdings (Pvt) Ltd.